Brief and clear explanations of 100 of the terms scholars use when discussing Matthew, Mark, Luke, and John. When you run across such terms in your reading of commentaries, you could look them up in your dictionary, but you won't get the technical meaning biblical scholars have. Brief and clear explanations of 100 of the terms scholars use when discussing Matthew, Mark, Luke, and John. When you run across such terms in your reading of commentaries, you could look them up in your dictionary, but you won't get the technical meaning biblical scholars have. 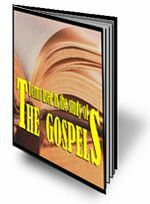 Here you will also get a brief introduction to the Synoptic Problem, Form Criticism, and other techniques used in an in-depth study of the canonical gospels.